ECMath-Projekt SE18 "Models for heat and charge-carrier flow in organic electronics"
(June 2017 - December 2018). The project is prolongated as a MATH+ transition project SE18 from January 2019 to September 2019. Organic electronics using carbon-based semiconductor materials surround us in our everyday life, e.g., in smartphone displays or solar cells. On the one hand, the technological adaption to other applications such as advanced lighting applications and thin-film transistors is still at an early stage. On the other hand, the tremendously fast pace in the development of new organic materials with fine-tuned properties yields the potential for smart 3D vertical structures with the desired electronic behavior. A characteristic property of all organic semiconductor materials is the carrier flow by means of a temperature-activated hopping (cf. [Kordt et al. 2015] between adjacent molecules. 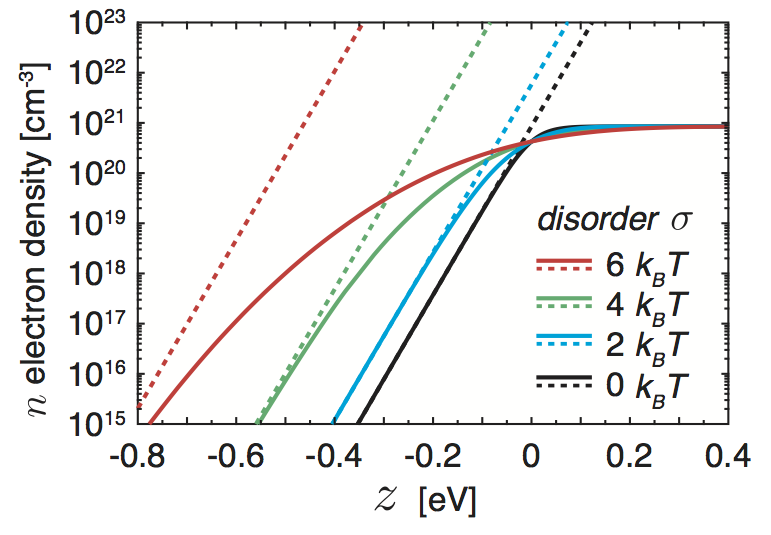 This leads in connection with Joule self-heating to a strong positive feedback loop between power dissipation, temperature, conductivity, and current flow, resulting in a complicated nonlinear behavior in devices such as hysteresis, see [Fischer et al. 2014] and [Fischer et al. 2013]. In Matheon project D-SE2 , we developed a PDE thermistor model with effective material laws (cf. [Liero et al. 2015] and [Fuhrmann et al. 2017]) to describe the interplay of the total electrical current and the heat flow. However, electronic details such as electron and hole flow, recombination, and energy barriers at material interfaces are neglected. To be more predictive with respect to diode behavior of advanced OLED concepts or current paths in small scale devices like organic transistors (cf. [Kaschura et al. 2016]), a more microscopic description incorporating electron and hole currents, recombinations (cf. [van der Holst et al. 2009]), and heterostructures is needed. A characterization of the behavior should be entirely based on the geometric structure and on the individual properties of each material layer. The aim of the project is to develop a thermodynamically correct energy-drift-diffusion model for organic semiconductor devices and its discretization and implementation in a simulation tool. The outcome of the project is a fundamental building block for a more efficient multi-scale and multi-physics description and simulation of organic devices. First, the transport of charge carriers in the isothermal case will be described on the basis of a drift-diffusion model, taking the distinctive features of organic materials into account. Second, the model will be extended in a thermodynamically consistent way to include the self-heating and the resulting feedback as well. In both points, the aspects of modeling, analysis, numerics, and simulation are considered. 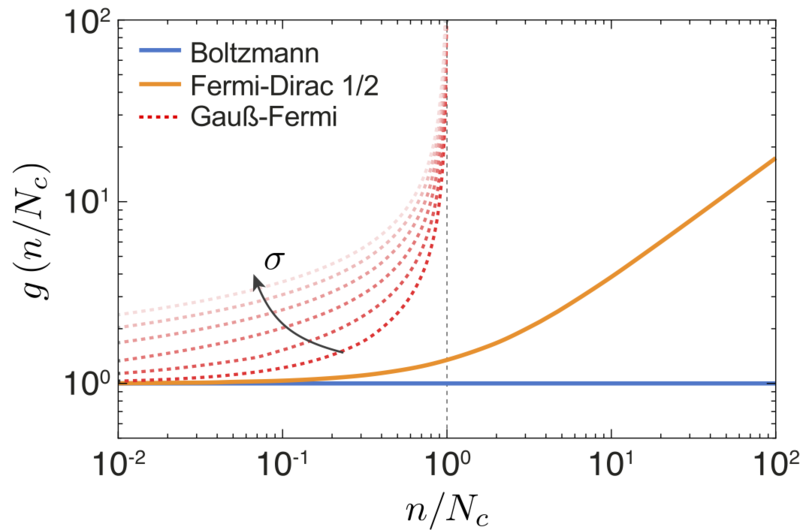 The approximation of drift-diffusion fluxes should be based on generalized Scharfetter-Gummel schemes for problems with diffusion enhancement (cf. [Koprucki et al. 2014] and [Farrell et al. 2016]). There are several mathmatical challenges regarding a drift-diffusion description of organic devices: In organic semiconductors, the energy levels are Gaussian-distributed with disorder parameter σ such that the densities of electrons and holes are described by the Gauss-Fermi integrals (cf. [Paasch et al. 2010]) . This leads to a generalized Einstein relation and results in a nonlinear diffusion enhancement (cf. [van Mensfoort et al. 2008]) in the relation between drift and diffusion current. Moreover, the mobility functions for organic semiconductor materials with Gaussian disorder are increasing with respect to temperature, carrier density, and electrical field strength. We organized the workshop AMaSiS 2018 — Applied Mathematics and Simulation for Semiconductors at WIAS Berlin from October 8-10, 2018. The workshop homepage is here: Link. We gratefully acknowledge the support by ECMath and DFG. A. Glitzky and M. Liero: Instationary drift-diffusion problems with Gauss-Fermi statistics and field-dependent mobility for organic semiconductor devices, Preprint 2523, WIAS Berlin, 2018, to appear in Comm. Math. Sci. D. H. Doan, A. Glitzky, and M. Liero: Drift-diffusion modeling, analysis and simulation of organic semiconductor devices, Preprint 2493, WIAS Berlin, 2018.